Wow! 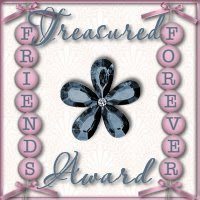 Two of my new blogger friends gave me this Treasured Friends Forever Award, and I say I’m forever grateful to both of you. Thanks so much, Seiko of Seiko’s Diary and Jacris of Mom’s Special Diary. What a sweet award to share. Thanks for thinking of me. You've truly touched my heart. Glad we became bloggers friends too. Your an amazing blogger. Hope you have a great weekend. Thanks for the award tetcha, I'll grab it asap. Hows the independence day celebration there? have a nice weekend to you and justin. Good morning Mommy Tetch,hope you don't mind addressing you like this hehe.Thank you so much Mommy Tetch for posting it,the moment I received this award your name accross into my mind & when I pass this onto you,I really mean it & hoping that this friendship of ours will lasts longer.Thank you for being so friendly to me.Hugs! Thanks a lot Te Tetcha.. muahhh! i have an award for you too: Best Blog Award. Hope you like it…Too busy and my baby boy is not feeling well kaya late ang pag-inform ko..Have a nice weekend! Congrats all on your award! Thank you so much for thinking of me. I appreciate it. I'm sorry for being an absentee blog friend. I'll make it up to you soon. Enjoy the rest of the week.